REDDING, Calif. - After being out of school for 10 years, Regina Weston challenged herself to pursue her dream of finishing her college degree. Between working full-time, spending time with her family, and being a member of her local roller derby team, Weston needed a degree program that fit her active lifestyle. 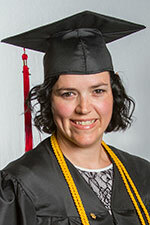 Weston, 38, of Weed achieved her dream by receiving her bachelor of arts in organizational leadership at Simpson University’s spring commencement ceremony on April 30. She was also inducted into Alpha Sigma Lambda, a national honor society for continuing education students who maintain at least a 3.8 grade point average. Prior to enrolling at Simpson, Weston was working full-time as a resource and referral program specialist at Siskiyou Child Care Council, a non-profit organization that helps families find quality childcare. Her desire to take on a greater leadership role within a non-profit was another reason she returned to school. While in the ASPIRE program, Weston was part of a 16-month-long online degree program, which she started in January 2015. She stayed connected with professors and classmates using Skype and Moodle, Simpson’s online learning management system. In addition to organizational leadership, the ASPIRE program offers an online B.A. in psychology. One of the challenges Weston faced in pursing her education was time management. Weston works full-time as a program director at the Family and Community Resource Center of Weed. She said she applied for the job last summer because of the skills she had already gained from classes. “I can honestly say that I would not have even applied for this job if it had not been for the organizational leadership program and the confidence that I had in myself and my abilities to be a successful leader,” she said. Weston said she enjoyed all aspects of the ASPIRE program, including being part of the Simpson community and getting to know her academic advisor and professors. Based on her positive experience, Weston said she would recommend the ASPIRE program to others. Weston said she was also impacted spiritually while a part of the ASPIRE program. Weston plans to continue her journey of becoming a non-profit executive director by pursuing her master’s in organizational leadership with an emphasis in non-profit management through Simpson’s School of Graduate and Professional Studies.